Ride the bull. We dare you. 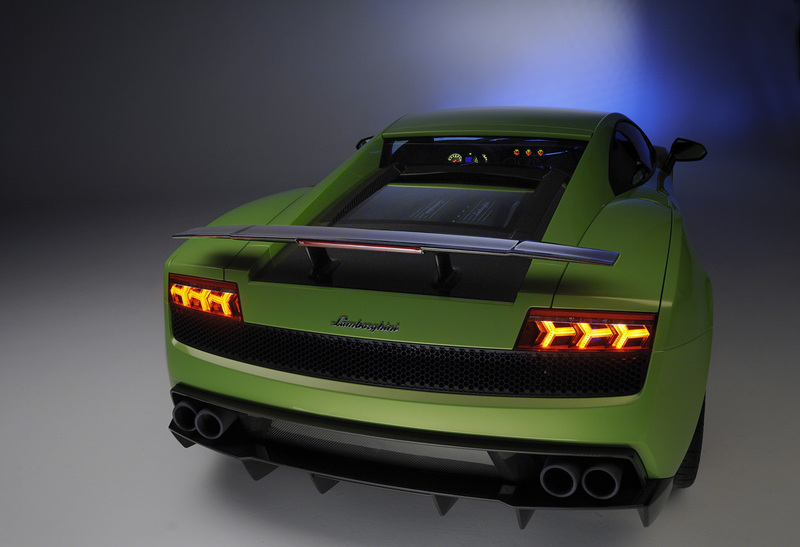 Longitudinale posteriore, 570 CV, all wheel drive, superlight – the new Gallardo LP570-4 Superleggera. Weighing in 154 pounds lighter than its stablemate, the Gallardo LP560-4, the new Superleggera also benefits from numerous aerodynamic components and an increase in horsepower to become the ultimate Gallardo. The 5.2-liter V-10 engine in the Gallardo LP570-4 Superleggera boasts an output of 562 horsepower (570 CV) at 8,000 RPM, and 398.3 lb-ft of torque at 6,500 RPM. The increase in horsepower comes from the revised engine management system. The engine is mounted “longitudinale posteriore” – meaning that it is positioned longitudinally behind the driver. Unique to the Superleggera’s 5.2-liter are a dry sump lubrication system and a cylinder angle of 90 degrees, which improves the handling and lowers the center of gravity. The Superleggera also benefits from the new “Iniezione Diretta Stratificata” (gasoline direct injection) that sprays fuel into the combustion chamber at 100 BAR, helping to increase efficiency by 20.5 percent over its predecessor, and achieve 16 mpg. Although the V-10 is a shade greener, a sharp scream still bellows from the quad exhaust. Standard on the Gallardo LP570-4 Superleggera is a lightning fast six-speed automated manual e-gear transmission that is operated by two steering wheel mounted paddles. 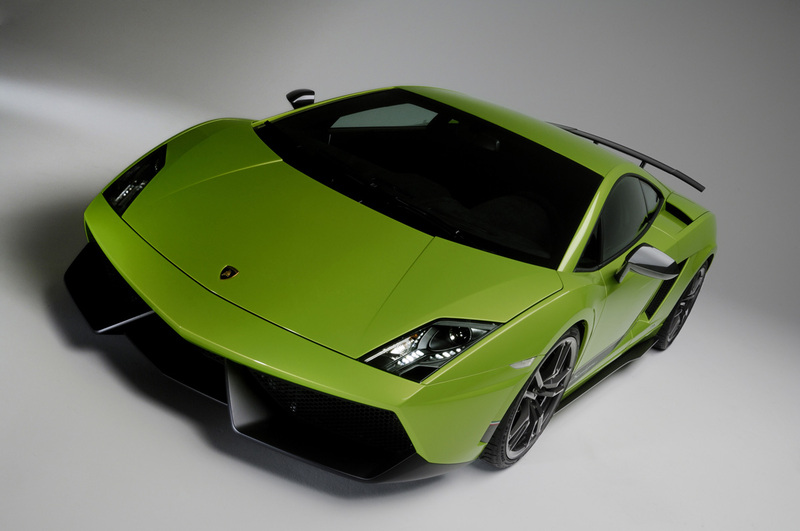 The transmission sends power to all four wheels – hence the “4” in LP570-4. The all-wheel drive system uses a 45 percent limited slip rear differential and a central viscous coupling. The ratio of power sent to the front and rear axles during normal driving is 30:70, for sporty driving dynamics. The all wheel drive system contributes to fast acceleration times, sending the Superleggera to 62 mph in just 3.4 seconds while reaching 124 mph takes only 10.2 seconds. Top speed is a screaming 202 mph. The Gallardo LP570-4 Superleggera benefits from a revised suspension that provides precise and sharp handling. The Superleggera was designed based on information gained during the Lamborghini Blancpain Super Trofeo racing series, making it the closest Gallardo to a racecar. 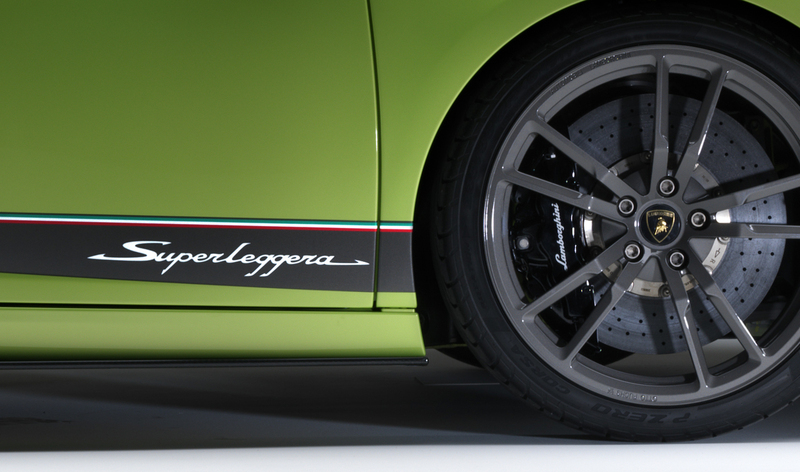 Stiff shock absorbers along with reinforced anti-roll bars and suspension mounts allow the Superleggera to push the limits of handling. Lightweight wheels and brakes give the Gallardo LP570-4 Superleggera both a stunning look and increased performance. The 19-inch aluminum forged wheels are extremely lightweight, and shed 28.6 pounds. Titanium wheel bolts are used for their high strength and light weight. Specially developed Pirelli P Zero Corsa series tires are fitted and closely resemble race tires for extreme grip, measuring 235/35 ZR19 at the front and 295/30 ZR19 at the rear. Eight-piston front and four-piston rear calipers shine through the lightweight wheels, and feature 14.37-inch front and 14.02-inch rear ventilated brake discs. Optionally carbon fiber ceramic brakes can be fitted for extreme stopping power and measure 15 inches at the front with six-piston calipers. Based on the same 3108.5-pound bodyshell as the Gallardo LP560-4, Lamborghini engineers were able to shed 154 pounds to achieve a dry weight of 2954 pounds, making the Superleggera the lightest model in the Lamborghini range. To reduce weight, engineers used carbon fiber throughout the interior and exterior, contributing to 88 of the 154 pounds of lost weight. 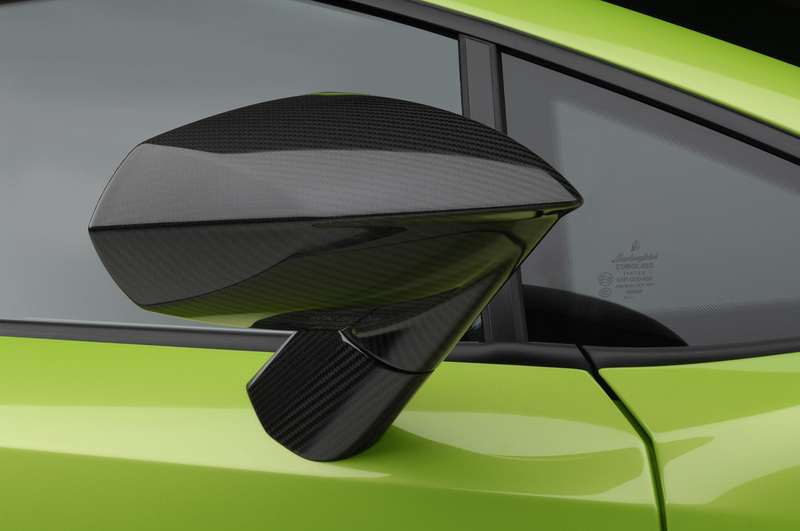 The cover section running from the roof to the rear of the car, rear spoiler, side sills, diffuser, mirror casings, and parts of the underbody paneling are all made of carbon fiber. At the rear, the engine cover, rear windshield, and side windows were made from a lightweight and durable polycarbonate. Other exterior modifications center on increasing aerodynamics, and have been designed in conjunction with wind tunnel experts. 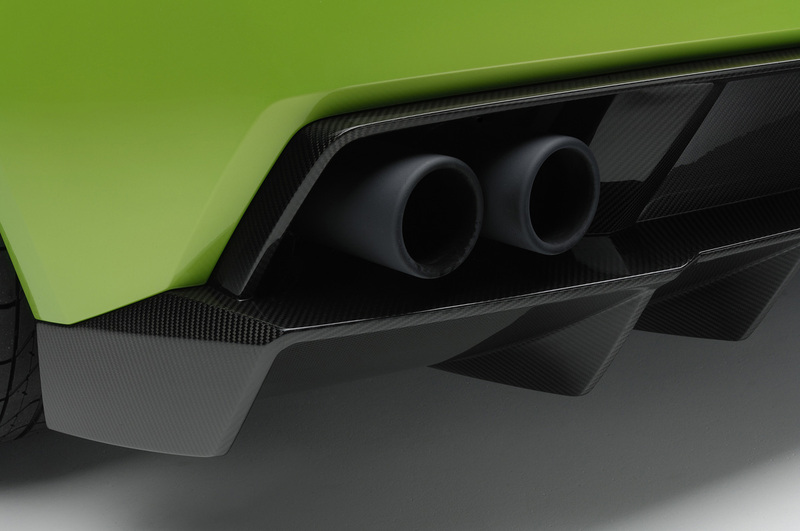 A covered underbody with redesigned sill elements and a new rear diffuser redirect air underneath the car, while a small rear spoiler increases downforce. Additionally the front bumper has been redesigned with larger air intakes, and features a sharp V-shape with black elements and integrated LED daytime running lights. Six flashy and in-your-face exterior paint finishes will be available. Inside the Gallardo LP570-4 Superleggera is bathed in a sea of carbon fiber and alcantara to further reduce weight. The center console, door panels, and surround of the e-gear transmission lever are all clad in carbon fiber. 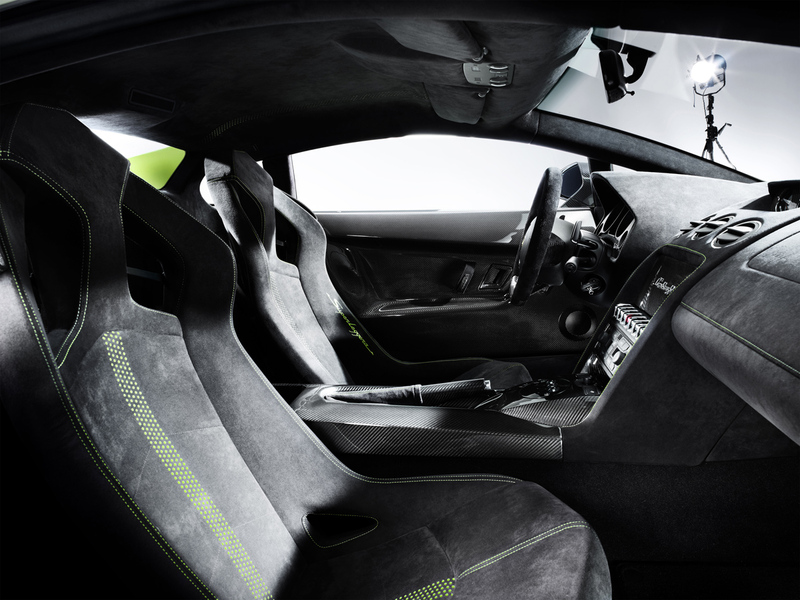 The sport seats feature a carbon fiber shell and are covered in alcantara for a comfortable yet sporty feel. The roof and floor mats are finished in the Lamborghini black finish for a sinister appearance. Contrasting seat trims and finish in green, yellow, orange, or two shades of gray are available. Although weight reduction was a goal for Lamborghini, the Superleggera still benefits from the comforts of air conditioning and electric powered windows. Numerous options to enhance the Superleggera are available. Colored brake calipers, a larger rear spoiler, and Lamborghini’s “Ad Personam” personalization program create a custom exterior. Inside four-point seatbelts, steel roll cage, and fire extinguisher are available for improved safety. Creature comforts such as multimedia navigation, rear view camera, and a lift system to avoid obstacles are also available. Pricing for the Gallardo LP570-4 Superleggera has not been released, but expect the base price to begin around $230,000.